The rapidly growing suburban areas north of Charlotte, N.C., are drawing in young families. As a result, Community in Christ Lutheran Church in the town of Cornelius is enjoying a growing membership of young families. Eight years ago, it became clear that the congregation’s 140-seat sanctuary was no longer adequate for an expanding membership – a problem any congregation would be delighted to have. So planning began in 2007 to build a larger facility with a larger sanctuary. The Great Recession intervened, but the congregation was not deterred. “We had launched a capital campaign, and we continued raising money,” recalls Travis Norton, one of the pastors. The congregation turned to the Mission Investment Fund (MIF) for consultation. 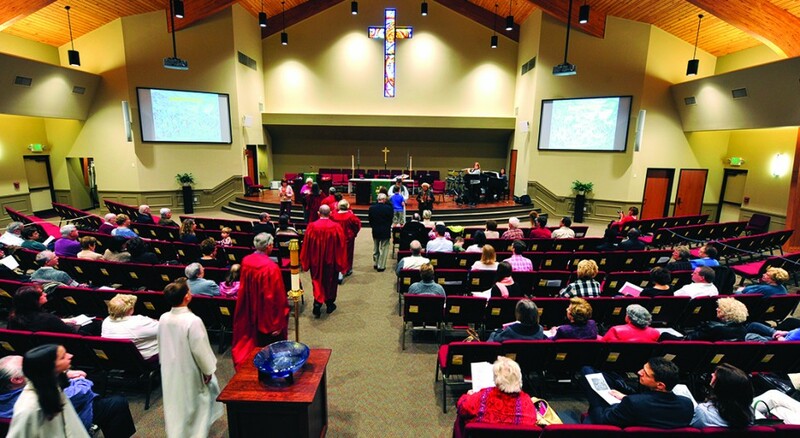 As the ELCA’s lending ministry, MIF makes low-interest loans to congregations and ELCA-related ministries for building projects, including the construction of church buildings as well as renovations, additions and upgrades with environmentally sound, sustainable features. For Community in Christ, MIF’s experienced church-building consultant recommended a manageable – and affordable – expansion: a 7,000-square-foot building with a 300-seat sanctuary. Community in Christ’s new building was dedicated on Palm Sunday 2014. Now, with the addition of a second Sunday worship service, more than 360 weekly worshipers fit comfortably in the 300-seat sacred space. The sanctuary is wider than the original, and all worshipers are closer to the altar. The chancel area is elevated, and a more sophisticated system projects sound and images. For more information about MIF loans and investments, call MIF customer service toll-free at 877-886-3522 or go to their website.